Aug 15 2018 - The mighty Congo River both connects Kinshasa with Equateur Province where an Ebola epidemic began in May 2018 and separates the Democratic Republic of the Congo (DRC) from Congo-Brazzaville, hidden in the haze on the other bank. “Epidemiological surveillance in the Democratic Republic of the Congo is a massive challenge,” said Pierre Dimany while looking out to the river. Pierre is the Kinshasa coordinator of the National Programme for Border Hygiene (PNHF), a partner of IOM, the UN Migration Agency, in the Ebola response. On Tuesday 24 July, the country’s ninth epidemic was officially declared over, some two-and-a-half months after it began. In previous epidemics, cases were usually confined to remote areas in DRC’s vast rainforest, but this time around a total of four were reported in the Equateur provincial capital Mbandaka. This sparked fears that the fever, which often kills in a matter of days, would take hold of the city and work its way downstream to Kinshasa, where an estimated 12 million people live. 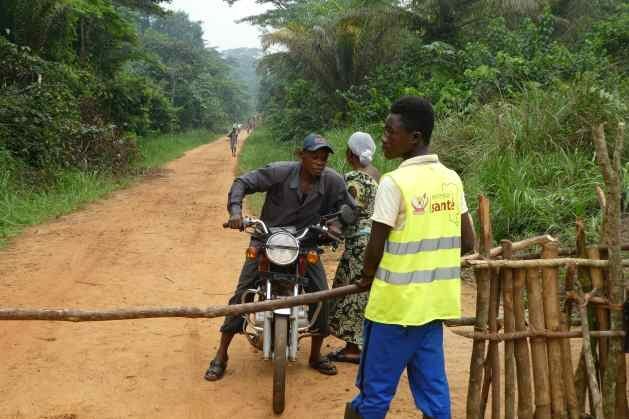 “We were all scared,” admitted Djo Ipaso Yoka, a young teacher recruited to carry out screenings at a post in Mbandaka at one of the points of entry to Wendji Secli motorbike taxi park. The epidemic started in two health zones deep in the equatorial forest, Bikoro and Iboko. The first victim, a health worker, had treated an old woman, who had come into a village from the forest because she was sick. From there the virus spread to Mbandaka in Bikoro health zone. Although the epidemic in Equateur was declared over, the country is constantly threatened by outbreaks. A new epidemic, the tenth in the DRC, was declared just days after the end of the Equateur outbreak. This latest medical emergency has sparked grave concern, as it is occurring in the east of the country close to a town with road links into neighbouring Uganda.